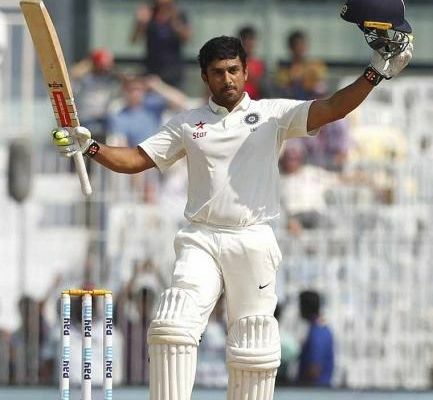 Karun Nair became only the third player in Test history to turn his maiden hundred into a triple century and took India to their highest-ever total in Tests in the fifth Test against England. After India immediately declared at 759, England ended the day at 12/0, 270 runs behind the hosts. India resumed the day at 391/4 with a close eye on taking the innings lead. Murali Vijay, who picked up a shoulder injury yesterday, came in to bat with overnight unbeaten batsman Karun Nair. England started the day with spinners from both the ends, and it seemed a good ploy as Dawson could manage to extract turn from the wicket. Vijay looked tentative against the English spinners and never looked settled. But it was the middle-order batsman Karun Nair, who stole the show by showing sublime application and artistry against the variable turn and bounce of the English spinners. Nair gathered 51 runs in the first session to score the first century of his international career, despite facing a couple of uncertain moments. In the seventh over of the day, Vijay tried to drive a Stuart Broad ball, which should have been left alone, only to give a thin nick to Jonny Bairstow behind the stumps. The England fielders all went up spontaneously but umpire Simon Fry shook his head in denial, and England had no reviews left with them. But Vijay couldn’t build on that life as he became the only man to get out in the first session. He became Liam Dawson’s maiden Test wicket after making 29 runs. Another local boy Ravichandran Ashwin was giving company to Nair at lunch on 9. England failed to find a breakthrough as Ashwin and Nair continued to amass runs at will. The former brought up his half-century in the 159th over much to the joy of the local fans with a boundary off Jennings. The bowler nearly avenged that a few overs later when he trapped the Indian spinner in front of the wicket for what would have been his first Test wicket. However, Ashwin asked for the review and the ball-tracking system suggested that it would miss the leg stump. Ashwin survived but was eventually dismissed by Stuart Broad for 67 as Buttler took a brilliant catch in the gully. Karun Nair kept going at the other end, though, and completed his double century. His childhood friend KL Rahul, who missed his 200 by a solitary run, led the celebrations in the dressing room. Joe Root dropped a difficult chance to dismiss the Karnataka batsman in the 172nd over, and that proved to be a costly mistake. Ravindra Jadeja, who joined Nair after Ashwin’s dismissal, played a very aggressive knock at the other end, and reached his 50 in no time. Nair, who received another lease of life when Bairstow missed a stumping opportunity in the 180th over off Ali, opened up his arms as well as India looked in no mood to declare. Nair went after Rashid and hit him for 4 fours and one six in the space of a couple of overs, before bringing up his triple hundred with another boundary off the Englishman in the 191th over. India declared the innings immediately after Nair's triple century with just five overs left in the day. An aggressive Kohli, looking to pick up a wicket, started the second-innings proceedings with two spinners Ravichandran Ashwin and Ravindra Jadeja, but England openers Alastair Cook and Keaton Jennings nullified them and ended the day at 12/0.